QuickBooks Desktop For WHMCS module enables the two-way integration between WHMCS and QuickBooks Desktop and thereby helps you improve your accounting management. 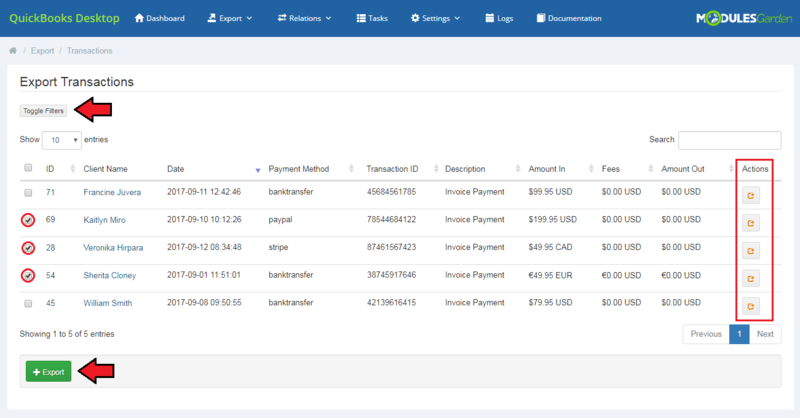 This module synchronizes the clients, invoices and transaction details gathered in your WHMCS with QuickBooks database. You can integrate the data either manually or automatically using a cron job. It is also possible to preview all the exported data thanks to the summaries available on the dashboard and logs. This tutorial will show you how to successfully install and configure QuickBooks Desktop For WHMCS. 4. 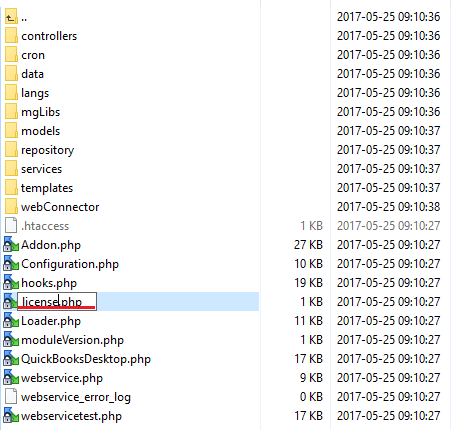 When you install QuickBooks Desktop For WHMCS for the first time you have to rename 'license_RENAME.php' file. File is located in 'modules/addons/QuickBooks_Desktop/license_RENAME.php'. Rename it from 'license_RENAME.php' to 'license.php'. Log in to your WHMCS admin area. Go to 'Setup' → 'Addon Modules' . Afterwards, find 'QuickBooks Desktop' and press 'Activate' button. 7. In the next step, you need to enable the access to this module. To do so, click on 'Configure' button, check the required group of administrators and press 'Save Changes'. 8. You have just successfully installed QuickBooks Desktop For WHMCS! You can access your module under 'Addons' → 'QuickBooks Desktop'. QuickBooks Desktop For WHMCS is a module which allows you to synchronize any data on clients, invoices and transactions with QuickBooks Desktop. 1. To configure your module properly, you first have to add a new account. To do so, proceed to 'Addons' → 'QuickBooks Desktop' → 'Settings' → 'Accounts'. 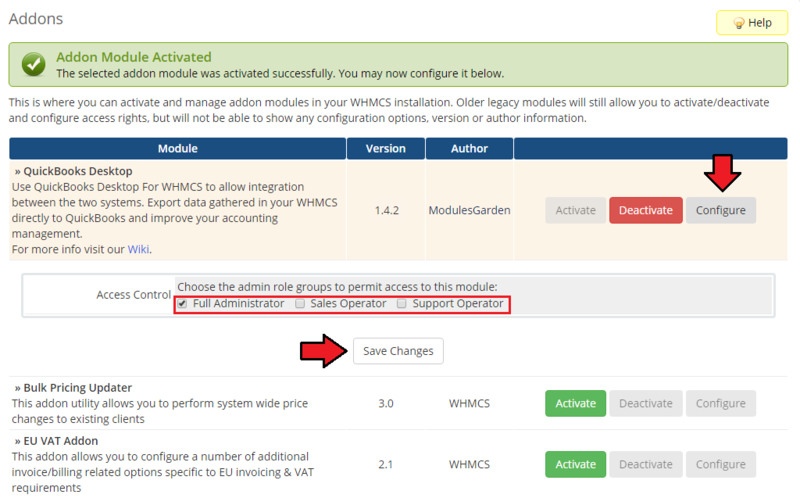 In order to use the module fully, your account will be linked to Web Connector, the tool that enables the integration beetween your WHMCS system and QuickBooks Desktop. Provide the necessary information. You can also specify when the data shall be synchronized automatically. Your account should appear on the list. It can be switched on/off, edited or deleted. For the proper configuration, you need to download the file of Web Connector now, as shown below. 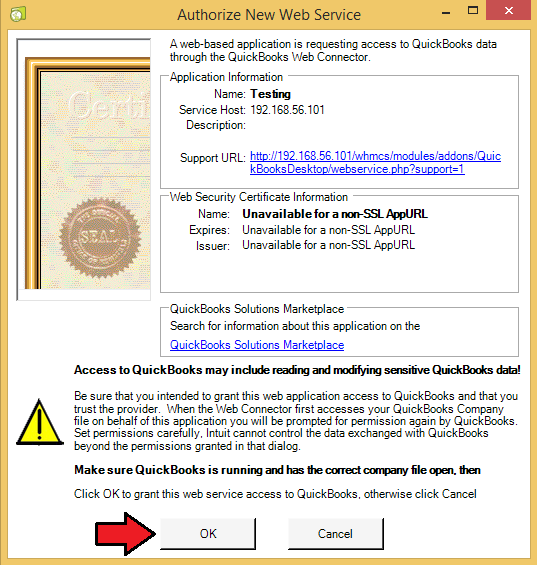 Be sure that your QuickBooks Desktop software is now running and there is your company file opened within in. 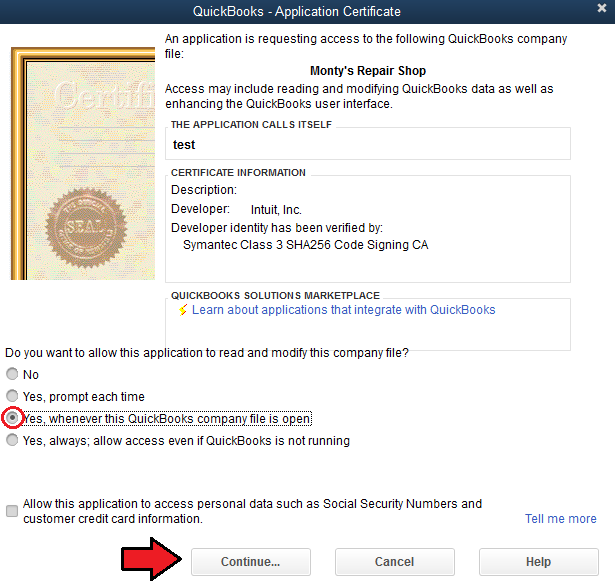 Then, open the generated account file in the QuickBooks Web Connector. Click 'OK'. It will allow the module to authenticate your identity in QuickBooks system and let your WHMCS connect with it. Next, the certification window will appear to ask for permission to read and modify your company file. Choose the appropriate option and continue. 2. Synchronization Settings - decide which of the possible synchronization options you want to enable. Proceed to 'Addons' → 'QuickBooks Desktop' → 'Settings' → 'General' and tick the ones you are interested in. Note: To enable the synchronization between the setting fields and their equivalents in QuickBooks Desktop, the 'Default Tasks' are required that will automatically run the necessary actions. Since the 1.1.0 module version, the 'Default Tasks' are automatically added to the 'Tasks' list after the addon activation. If you are using previous versions, you have to manually press on the 'Default Tasks' button to add all tasks to the list. In the 'Task' tab, you can check whether all the tasks are completed. Only then the values will be visible. 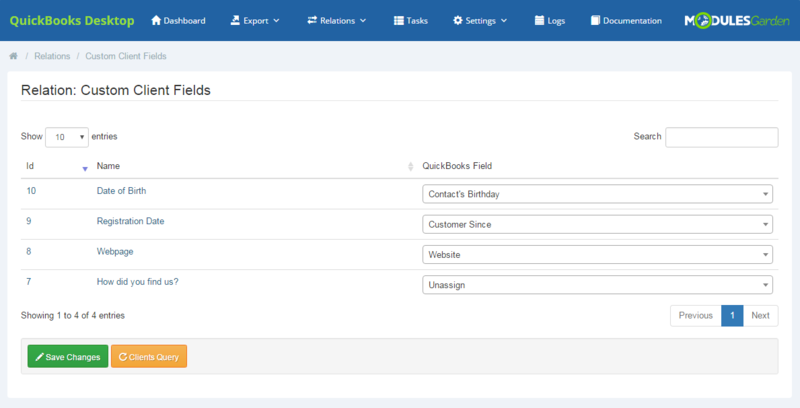 Using the available fields, define the client name format that will be exported to QuickBooks Desktop. The above format will result in exporting only company names for the clients who own them, otherwise, their first and last names will be exported. For more information about Import Synchronization configuration, go to the Cron Jobs section. Apart from choosing the required synchronization options, you have to decide which items from QuickBooks Desktop will be associated with 'Products ' and 'Domains' . Note: Default Product will be used only when there is no relation set for the selected product in 'Relation: Product' section. Choose other options from the dropdown menu to set up. Sandbox Date - by default, the date used in 'sandbox mode' is different from the actual one. Here you can change it. Request Limit - Too many queries executed at once may cause the web connector to stop working. In that case you can limit the number of requests here. Failure Notifications - in this section you can select one administrator who will receive an email notification (in either hourly or daily intervals) about failures in the selected tasks. This is executed by cron job. All the tasks and their statuses will be displayed in the Task tab. Note: Some tasks are automatically blocked when created. However, they will be automatically unlocked at a later stage of execution. 3. To use the module properly, remember to set the relations correctly. It is possible to manually declare relations between WHMCS clients, products as well as invoices and corresponding QuickBooks Desktop elements. This feature is especially helpful to avoid confusion and misunderstandings. Please note that this is an extra option, which grants you the possibility to manually configure relations. One of possible relations to be declared are relations between WHMCS clients and QuickBooks customers. those who have not been exported to QuickBooks Desktop yet as well as those already exported. All exported and imported clients have automatically set relations. It is possible to match clients relations using 'Match Clients' button or manually choose them from the dropdown menu in 'QuickBooks Customer' section. When you go to 'Relation' → Custom Client Fields' , you will find a list of fields which appear in the client profile. Firstly, select 'Clients Query' option and wait until all tasks are done. Note that if all clients in QuickBooks Desktop have the same custom field with no value provided, that field will not be synchronized and displayed on the list. At least one of the clients has to have it filled in. Proceed to 'Relation' → 'Products,' you will find there a list of all products with their type and payment standard. In the last column, there is a dropdown menu with all QuickBooks Desktop items that can be assigned to exported products. In 'Relation' → 'Invoices' directory, you will find a list of all WHMCS invoices with their ID, date of creation, assigned client, total sum and status. It is possible to assign such a WHMCS invoice to another invoice already exported to QuickBooks Desktop. Just choose such from a dropdown menu and save changes. Transactions between the two invoices will be synchronized then. In 'Relation' → 'Tax Rules' directory, you will find a list of defined tax rules. 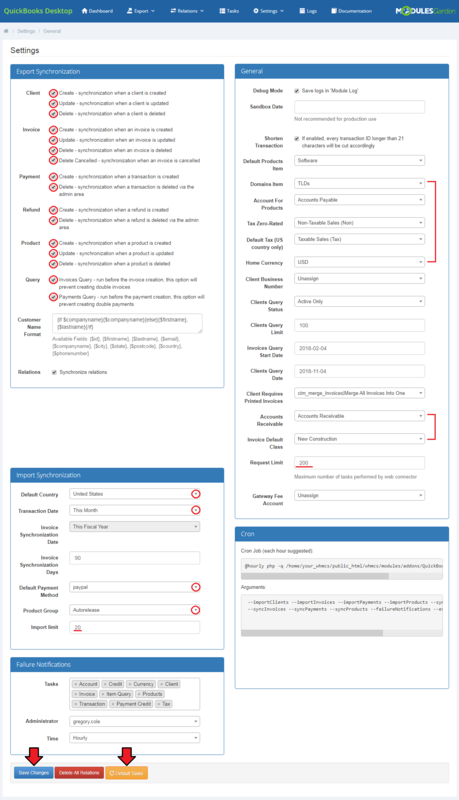 Firstly, select 'Tax Rules Query' option and wait until all tasks are completed. Then, assign each rule to a specific QuickBooks tax. Select one from a dropdown menu and save changes. Note: QuickBooks Desktop does not support WHMCS's level 2 taxes. Only level 1 taxes are supported. In 'Relation' → 'Currencies' directory, you will find a list of defined currencies. Firstly, select 'Currencies Query' option and wait until all tasks are completed. 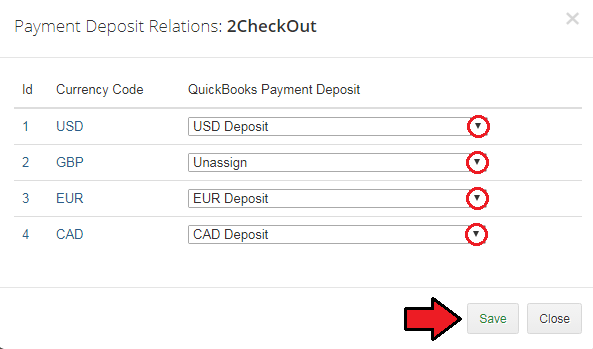 Then, assign each currency to a specific one from QuickBooks Desktop. Select one from a dropdown menu and save changes. Note that if you would like to use several currencies, 'Multicurrency' option has to be enabled in QuickBooks Desktop settings. Otherwise, the process will not be successful. In 'Relations' → 'Payment Gateways', there is a list of available payment methods. Select the one you wish to use from a dropdown menu. Save changes. When you click the button in the 'Action' section, you can set relations for previously chosen payment mathod. Assign QuickBooks Payment Deposits to a single currency. In this way, the relation between payment methods, upon which choosing the deposit a transaction in selected currency will go to depends, has been set. Finally, do not forget to save changes. 'Relations' → 'Credit Payment' section allows insight into the ist of transactions with option to synchronize them manualy. 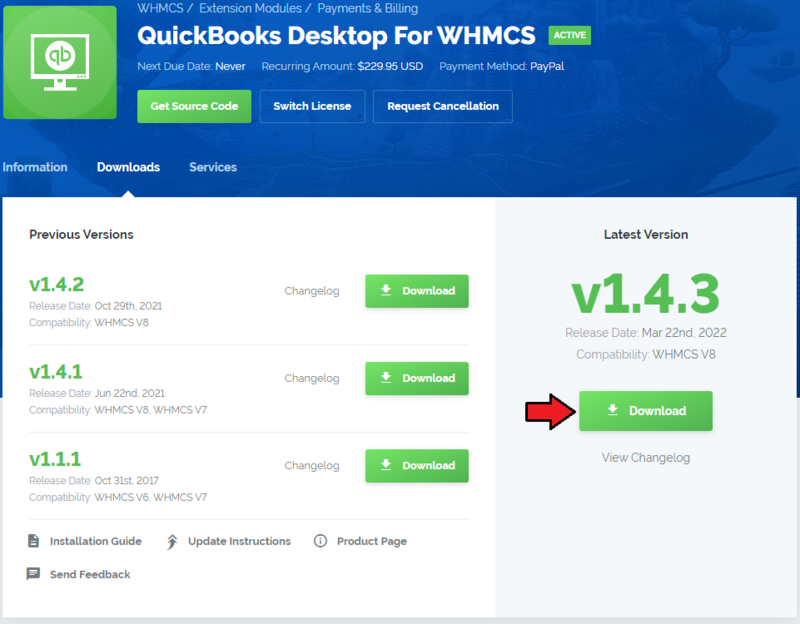 In this section, we will show you the possibilities of QuickBooks Desktop For WHMCS. Once it has been properly connected with QuickBooks Desktop and all the configuration is complete, we can move to the 'Export' section. Our module offers several ways to export any data gathered in your WHMCS. Read the below points to learn what data can be synchronized with QuickBooks Desktop and what are the possible means of such synchronization. The first option offered by our module is the export of clients from WHMCS to QuickBooks Desktop, proceed to 'Export' → 'Clients.' 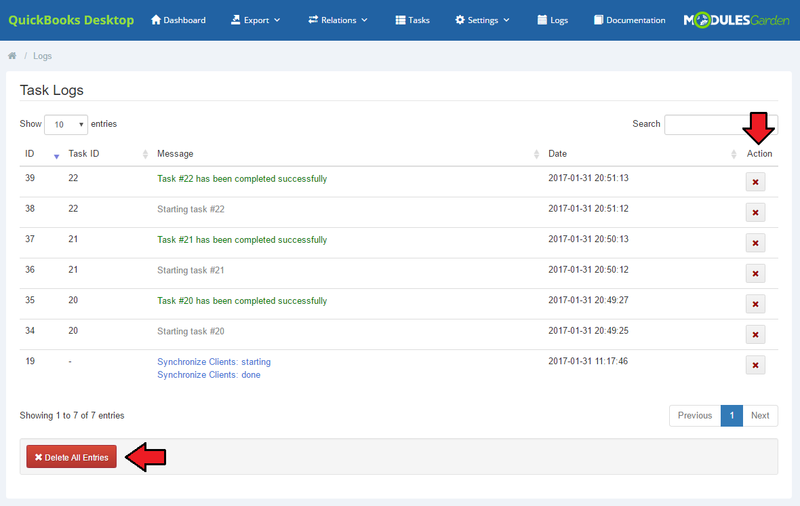 You will see a list of all clients who exist in your WHMCS and have not been synchronized with QuickBooks yet. Use the filter to find clients with their account created during the specified period of time. Now, you can manually export all of the clients available on the list or choose only some of them. Check boxes next to the clients you are going to export and press 'Export' button as marked on the screen. If you want to export only one client you can do it by pressing 'Export' button located in 'Action' column next to the name of the client. 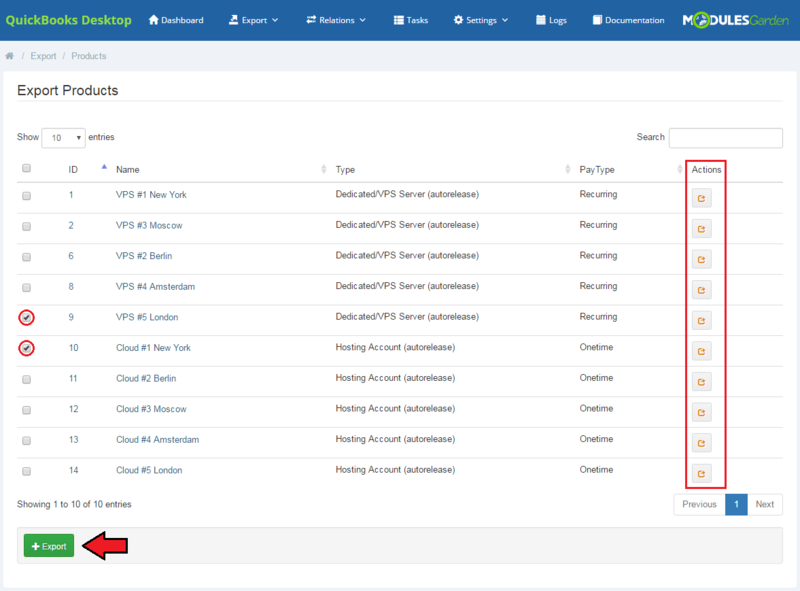 If a client has already been exported from WHMCS to QuickBooks, they will no longer be visible on the list. The other choice is the export of invoices. Proceed to 'Export' → 'Invoices' and you will find a list of all invoices existing in our WHMCS that have not been synchronized with QuickBooks yet. export individual invoices to QuickBooks. Use buttons marked on the screen to perform the above enumerated actions. 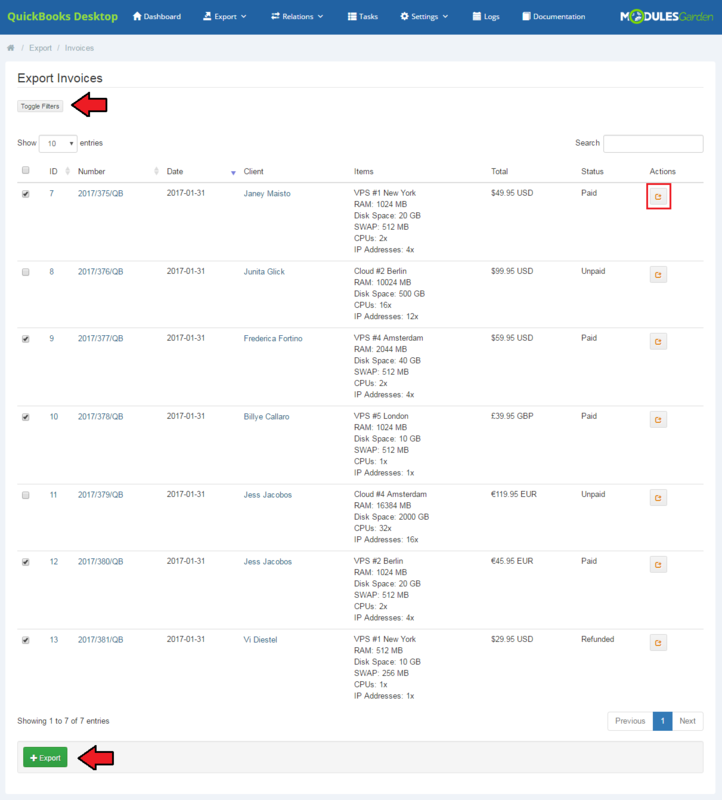 Once you have exported some of the invoices, you will see their number along with the number of any transactions connected with them in the 'Summary' table on the dashboard. In 'Export' → 'Transactions' section you will find a list of payments for exported invoices. 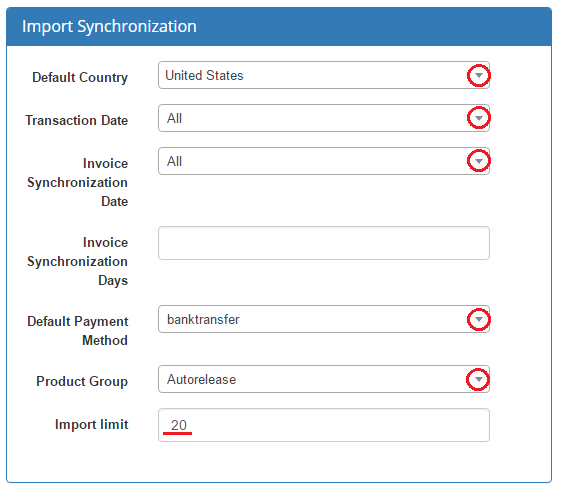 Note that only these transactions that could not be exported automatically during the invoice export will be visible or if the 'Payment Create' option in 'Export Synchronization' in general settings is disabled. If you would like to manually export products from WHMCS to your QuickBooks Desktop, please go to the 'Export' → 'Products' section. Then, select the products you want to be exported and press on the 'Export' button. Properly set up cron job with a recommended interval is responsible for importing and synchronization of data from QuickBooks into WHMCS e.g. any updates carried out on invoices or clients' accounts from WHMCS. 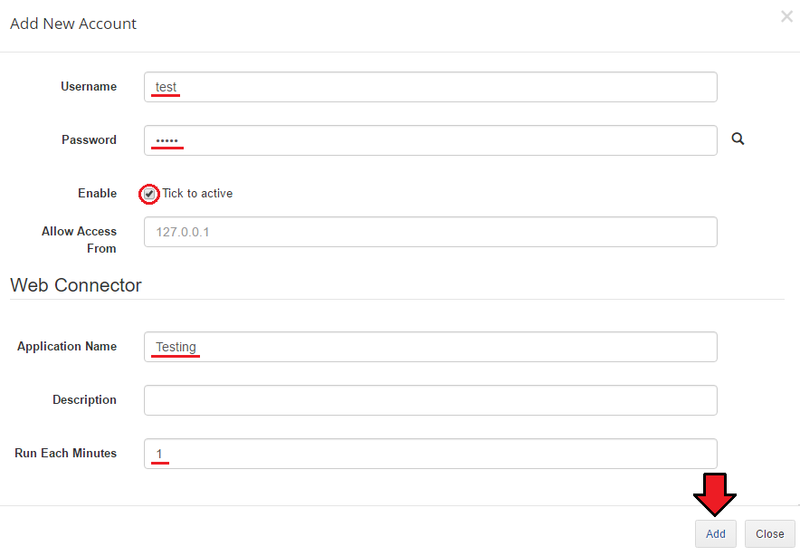 Once the cron is running, it executes settings included in 'Import Synchronization' table and will also send the notifications specified in the 'Failure Notifications' section. Transaction Date - downloads transactions according to a selected criterion, for example: 'This Month' will retrieve transactions from current QuickBooks month. Invoice Synchronization Date - gets invoices according to the selected criterion, for example: 'This Month' will retrieve invoices from current QuickBooks month. 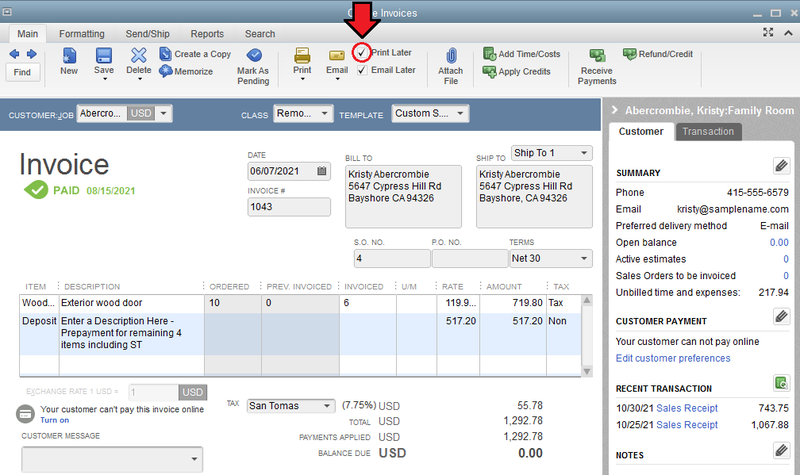 Invoice Synchronization Days - if set receives invoices, e.g. from the last 5 days. 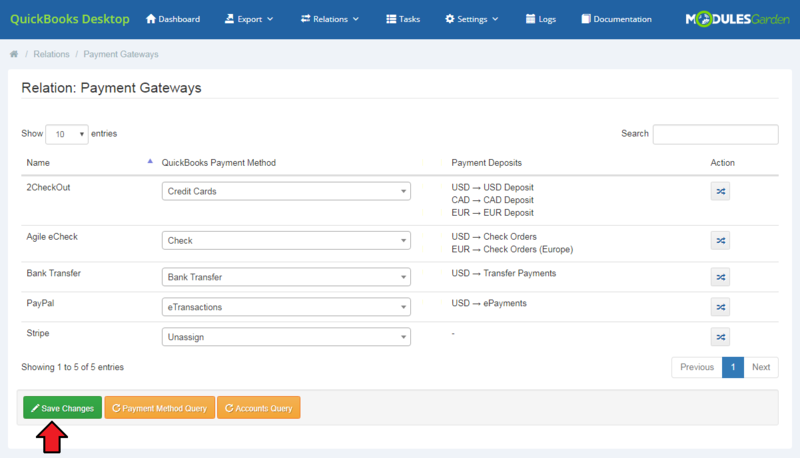 Default Payment Method - the default method that will be set for importing payments from QuickBooks to WHMCS. Product Group - the default group for the imported product. Import Limit - if the provided limit is reached, the script execution ends. It is recommended to run a cron job every six hours in order to synchronize the data between QuickBooks Desktop and WHMCS. To do so, use 'php -q /var/www/whmcs/modules/addons/QuickBooksDesktop/cron/cron.php' cron with the following arguments: '--syncClients --syncInvoices --syncPayments --syncProducts'. with the following arguments: '--importClients --importInvoices --importPayments --importProducts' once a day. If you want to synchronize clients, invoices, payments or products you can also use the following arguments: '--syncClients --syncInvoices --syncPayments --syncProducts'. The last available '--failureNotifications' argument is responsible for sending email notifications of failure tasks, as specified in the 'Failure Notifications' section. 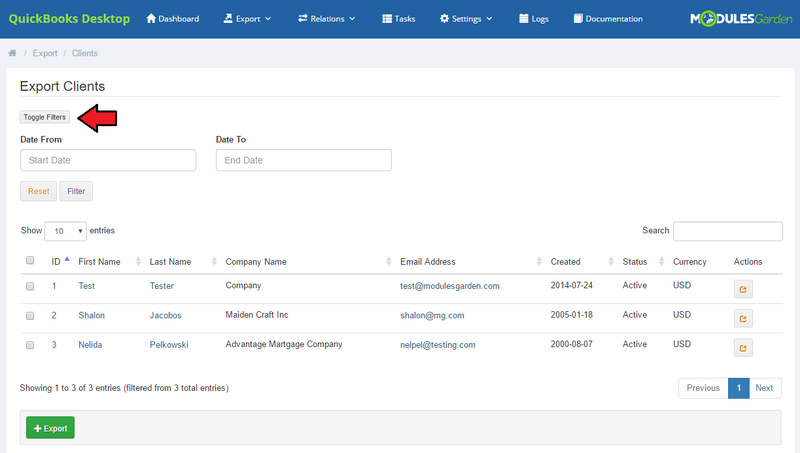 The 'Logs' tab contains ALL actions on clients, invoices and transactions. Regardless of whether they were performed manually in the module, automatically or by a cron job. You will find there a list of all entries with precisely described details and the exact date of the action. Clear all the entries or delete only some of them. Use the buttons marked on the screen above. 'Dashboard' includes two useful and user-friendly tables. The first one, 'Export Summary' contains data on the number of exported clients, invoices and payments. The number includes exports performed in all possible manners. The second table shows information about the number of performed tasks with their statuses. The very last tab - 'Documentation' , once clicked, will redirect you to the article you are currently reading! 1. Please note that QuickBooks Desktop supports the services of One Time type only. Other billing cycles cannot be added. 2. If you add a single transaction in WHMCS using the 'Add to Client's Credit Balance' option, a transaction corresponding to this one will be also created in QuickBooks. 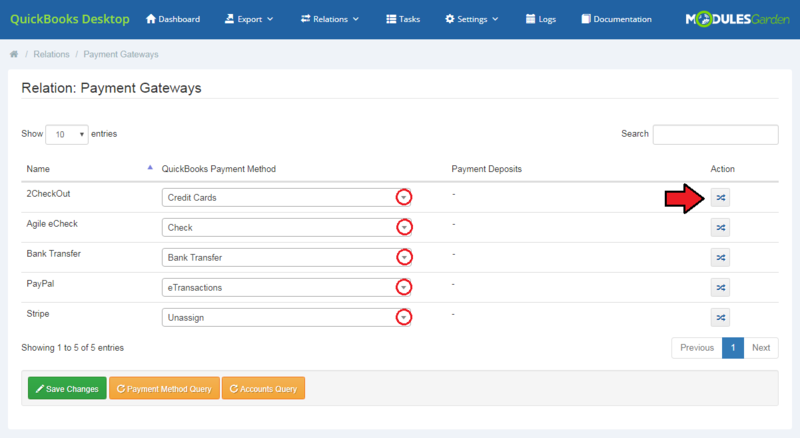 Afterwards, when the customer pays the invoice using WHMCS credits, this invoice will also be added to the previously created transaction in QuickBooks (provided that there are sufficient funds in this transaction). 2. It rare cases, taxes might be counted incorrectly for invoices with multiple items, whereby a part of the items is taxed and some are not. Please, be careful! 3. In case you encounter any issues with installation and configuration please make sure you have php7.0-soap installed. Without that the module will not work properly. 4. 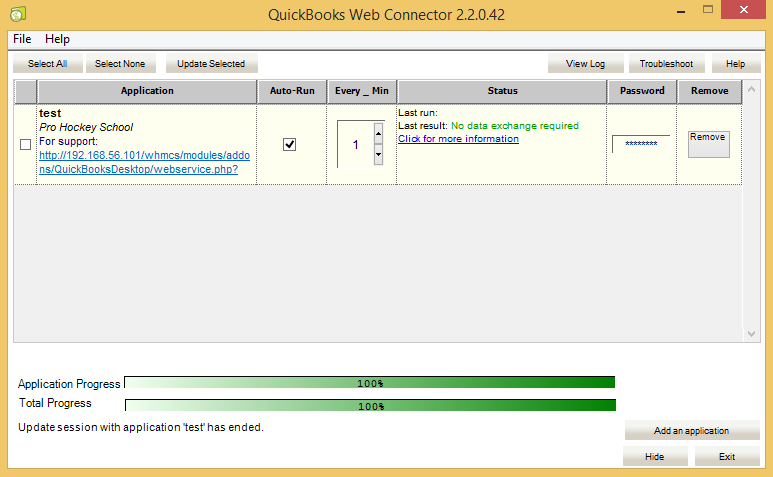 When .htaccess is enabled, the module may not work due to the lack of connection between QuickBooks Web Connector and WHMCS system. 5. In order for Web Connector to be linked with your WHMCS, your site has to be SSL cerified. 6. If you get the following error: 'Got a packet bigger than 'max_allowed_packet' bytes' you need to increase the max_allowed_packet parameter on your server. This command can be also performed in your phpMyAdmin if you are logged in as the root user. 7. In case you see 'The given object ID "0" in the field "list id" is invalid.' error, please check that 'Default Products Item' or 'Domains Item' fields are properly configured. 8. If you get an error 'Object specified in the request cannot be found' during the invoice export, make sure that you have 'Accounts Receivable' field selected in general settings. This page was last modified on 2 April 2019, at 13:25.